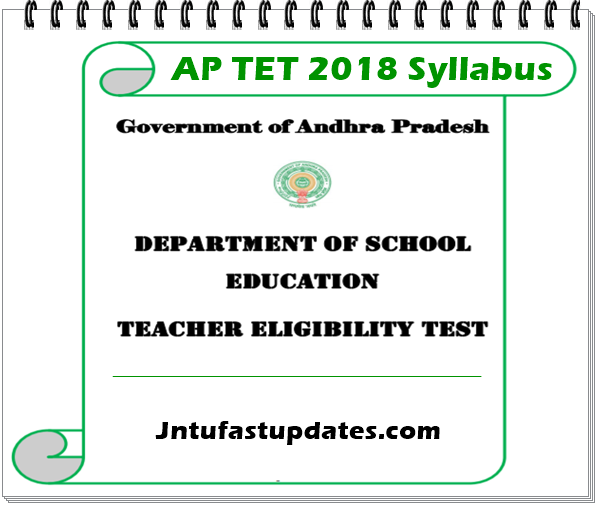 AP TET Syllabus 2018: Andhra Pradesh Teacher Eligibility Test 2018 Syllabus for Paper 1, Paper 2 are available. Candidates can download AP TET 2018 syllabi PDF For SGT, PET, Mathematics & Science, Social Studies, LP & SA from links given below. Government of Andhra Pradesh is going to conduct TET-2018. There will be 2 papers. TET Paper – I will be for a person who intends to be a teacher for class I to V. Paper II will be for a person who intends to be a teacher for class VI to VIII. The details of syllabus for Paper I & II are as follows. Online applications are invited for the Andhra Pradesh Teacher Eligibility Test (APTET-May, 2018) from candidates for all those aspiring to be Teachers in State Government, Mandal Parishad, ZillaParishad, Municipality, Private Aided Schools and Private un-aided schools in Andhra Pradesh State for classes I to VIII. The Andhra Pradesh Teacher Eligibility Test (APTET-2018) is being conducted by Department of School Education, Government of Andhra Pradesh in all 13 Districts of the State through a Computer Based Test. Syllabus for AP TET 2018 Paper I, Paper II (A & B) for each subject notified on website, also official PDF given below. ii) How to choose language – I of AP-TET Paper-I: The following languages are offered under First Language in the Schools under the State Syllabus viz., Telugu, Urdu, Hindi, Bengali, Kannada, Marathi, Tamil and Gujarathi. A Candidate has to choose one of these 8 Languages under Language-I of TET, those candidates should have compulsorily studied that Language either as medium of study or as First Language at least up to Class X. The candidates who studied CBSE/ ICSE curriculum can choose the Language which they studied up to Class X.
iv) The syllabi for Mathematics & Environmental Studies are designed on the basis of topics of Classes I to V. The difficulty standard as well as linkages of content/topics could be up to Secondary Stage (up to Class X) for testing. The test items in Mathematics and Environmental Studies will contain Multiple Choice Questions (MCQs) not only on Content but also on Pedagogy. In Mathematics, 24 MCQs will be on Content and 6 MCQs on Pedagogy. Similarly, in Environmental Studies 24 MCQs will be on Content and 6 MCQs on Pedagogy. vi) For 30 MCQs under Language I & II, each shall include 6 questions on Pedagogy of a Language. vii) The detailed syllabus for all subjects shall be the designed by the SCERT and the same shall be issued along with the Notification. TET Paper – II (A) is meant for School Assistants and Language Pandits. The syllabus for Part- A of Paper – II (A) Language-I (Telugu, Urdu, Tamil, Kannada, Odiya, Hindi, Sanskrit) & Language-II (English) will be tested up to class VIII level of A.P. present State syllabus. There is no Methodology test for Language I & II of Part A. The content of Part – B of Paper – II(A) will be tested up to class X level of present A.P. State syllabus and methodology will be tested on present B. Ed syllabus. TET Paper- II (B) is meant for Physical Education Teachers and School Assistant Physical Education. The syllabus for Part A of Paper – II (B) Language I & II will be tested up to class VII level of A.P. present State syllabus. The content and pedagogy of Paper – II(B) will be tested from D.P.Ed syllabus. Syllabus for Physical Education Teachers School Assistants / Physical Education. Please tell me whats the sylabus for tet and dsc new or old? By mistake l applied paper2 but it changed to paper3 so how I will get paper2 please tell me.